Seagreens® ingredients are the finest in their category - the result of two decades pioneering human food production and scientific study. We support NPD and ongoing product development with unparalled know-how, informed by our own years of trial and error. We also work with many intermediaries - contract manufacturers, ingredient and product development consultants, and nutritionists. Our customers use Seagreens functionally, for example to reduce salt, improve natural shelf life, or for their umami flavours. But above all to enhance the nutritional value of food and supplements, special diet foods, ready meals, soups, teas, tonics and smoothies. Seagreens® are widely used in nutritional therapy for their proven benefits in a range of health conditions, many of which are the subject of published research, and allow the use of approved and pending health claims. Our comparative analytical data on seaweed nutrients and contaminants is unique. We lead the field on quality assurance, applied nutrition research, and international regulatory compliance. Seagreens® has BRC and Nutritious Food Seaweed certification - the highest standard in the world - as well as niche certification like organic and kosher. We offer an unparallelled choice of species prepared in different forms to suit a wide range of food, drink and nutrition applications. Consistently nutritious, consistently compliant with food regulations, consistently researched ahead of the field, and consistently available from stock. When you use Seagreens®, consumers know what they're eating. Please click on the short presentation top right of this page for a very brief overview. Please click here to understand the nutritious seaweed ingredients we offer - today 15 forms across 5 different native species. Then please involve us in your proposed application as early as possible. We want your business, but above all we want to deliver value in all our relationships, (not just the bags of seaweed). Most of our customers identify the Seagreens® ingredient in their product. It supports reputation. We call them Brand Partners. We put our know how behind the seaweed ingredient in your product. If there are consumer issues, or negative press from inferior seaweeds, as has arisen in recent years, your brand is protected - consumers can understand the difference for themselves. And Brand Partners get additional help - with price, custom ingredients, and technical and marketing support. 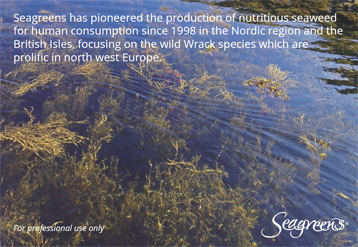 "Seagreens® is the UK's leading seaweed supplier"
There are seaweed ingredients in the market which should not enter the human food chain. Some are produced for horticulture, animal feed or extracts, or come from unchecked artisan production, collected by hand on the shoreline. Under direct supervision, our consortium partners harvest Seagreens species at remote locations in the British Isles and Nordic region. We conduct all our final processing in Britain. Seagreens® are 'made in Great Britain' and proudly exported direct and through our local distibution partners, to more than 12 countries around the world. For more information about our quality assurance standards and certification please click here. Our business model is an innovative, modern consortium, administered by the Seagreens Trust, in the interests of our Partners and Customers. Seagreens is the result of an Anglo-Scandinavian joint venture begun in the Trondheim archipelago, northern Norway, in 1997. Since then we have developed production at 5 different locations in the British Isles and Nordic region, gaining market experience worldwide. Simon Ranger set up Seagreens to produce nutritious food seaweed for food and drink ingredients and medical therapy. Our know-how today informs the highest production standard in the world, which also uses the 'seaweed person' trade mark which he registered in 1998. We will discuss your requirements or ideas in absolute confidence, and provide trial samples of our nutritious seaweed ingredients. We will never act without integrity, written into the DNA of our brand! Call +44 1444 400403 or email info@seagreens.co.uk. Or click here for full contact information and an enquiry form. Two people to contact directly: Geoff Van Hurst on 07931 528243 (Director of Operations), or Simon Ranger on 07957 432272 (Founder). For trade ordering please telephone +44 1342 888095, or email tradedirect@seagreens.co.uk. We hold stocks of our ingredient in the UK and in Germany and the USA. We will be pleased to put you in touch with your nearest Distribution Partner. Is the seaweed independently certified allergen free? How comprehensive is the analytical testing on every harvested batch? How many years of consistent analytical data lies behind the production? Is it British Retail Consortium certified? Can I see a current, comprehensive, independently certified analysis of the nutritonal composition? Will it comply with regulatory requirements in any world market where I may want to sell my product? Can it support you across all the application, technical and regulatory issues likely to arise? 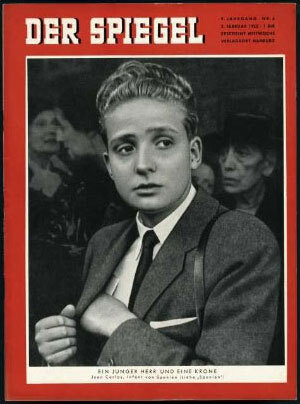 An article published in 1955 in the magazine "Der Spiegel" (in German) has come to light. The article is about a German man in the 50's importing seaweed from Norway and selling it to bakeries for use in bread making. Mr Lienau wanted to make seaweed usable for nutrition in Germany.